"Tremendous experience and knowledge in material handling. A pleasure to work with...."
"Maritime Paper has used BF Consulting Material Handling for more than thirty years. In the early 1980's they fully automated our internal materials handling process by adding kilometers of conveyors and several transfer cars. The system has stood the test of time and is still a source of pride for us. Bruce and now Doug have designed and installed many innovative solutions for us that help us stay modern and completive. We have watch BF Consulting Materials handing flourish as a company and we are proud to be a partner with them over all these years." "We have been dealing with Doug and his dad Bruce for 30 years and built a great relationship; always dependable and offering solutions to any problems and fixing our conveyers on short notice. We are very satisfied customers." Since 1982, BF Consulting has designed, sold, installed and serviced high quality conveyors and complete systems for business throughout Canada and beyond. BF Consulting's one-stop conveyor business model includes everything from single items and parts to fully customized turn-key conveyor systems. We can integrate key components into your existing material handling system. 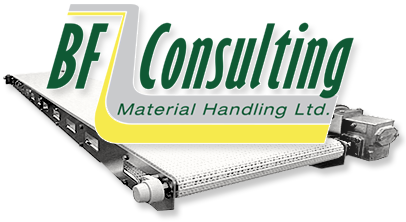 Located near Halifax, Nova Scotia, BF Consulting serves a broad range of material handling needs and will help you to select the correct conveyor for your needs and budget. Put our expertise in conveyor systems to work for you!